No matter how hard you try, no matter how deep you bury them, secrets want to come out. There is an inherent anxiety attached to secrets. They vibrate and twist and turn, always inching closer to the surface. Murderers dread that the bodies will be found. Adulterers leap when the phone rings, fretting over who the wife will hear on the other end of the line. Even when the secret is perfectly safe the world will try to ferret it out of you by sending endless coincidences to fuel your paranoia – the furtive alcoholic inevitably rides in the train car plastered with liquor advertisements. Eventually, the exact nature of the thing being kept secret is immaterial. Instead, the fear of being found out, exposed, begins its reign of terror. Ensuring that the world sees us how we wish it too and not how we truly are becomes the only goal. Well, I can’t live like this anymore. It is time for me to tell the truth about something that has been eating me up for years. I, Stu Horvath, never really liked Bioshock. I know I speak sacrilege. Ken Levine’s opus of Art Deco and Objectivism gone terribly wrong has been a sacred cow of the gaming industry since before it even hit shelves. And I’ve tried to love it. I really did. Everyone else did, why not me? People out there care about those Little Sisters, Stu. You should too. So I pretended. And for a while, it was all right. Years passed. 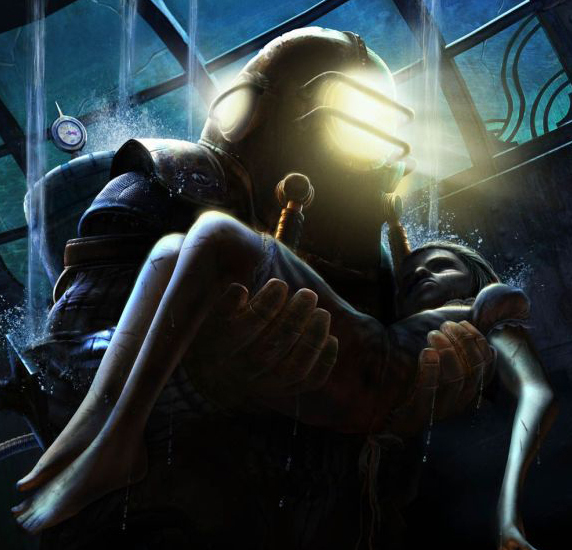 Bioshock 2 came and went without much fanfare. It was beginning to look like I could make it through the rest of my life without coming clean on this. Until yesterday, that is, when the world of videogame writers scrambled to crow over the teaser footage from the new Levine masterpiece in the making: Bioshock Infinite. The world was mocking me. It was time, I had to come out. So hear me now! Bioshock is not a particularly good game! I know you disagree already, but hear me out. Let’s start at the beginning. The plane crash over the Atlantic, the fire on the water, the lighthouse. 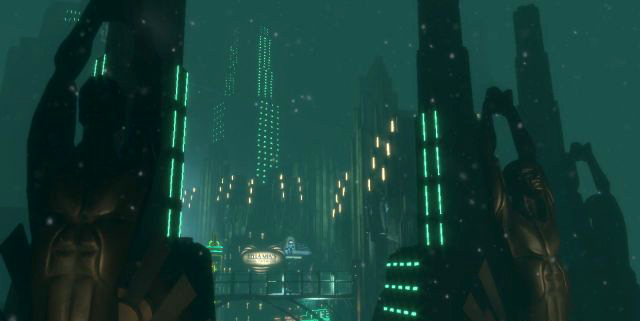 We go down the stairs and climb into the bathysphere, whereupon we are treated to a film narrated by Andrew Ryan and a panorama of the sunken, ruined city of Rapture. Our collective heads spin from the beautiful visuals, the dramatic presentation of this mysterious city and the dizzying monologue of its mad ruler. Yet I, as a player, have done nothing except a bit of swimming and walking. For most of the truly stunning events that just unfolded, I stood there doing not much of anything. After another set piece I get to stand around and watch, I finally step out into the world expecting something truly remarkable only to find…that I am playing yet another first person shooter. Despite the gorgeous environments, lush atmosphere and twisted philosophy on display, I wind up having to get the fire weapon to melt the ice to get to the doctor’s office to get the key to the next area. 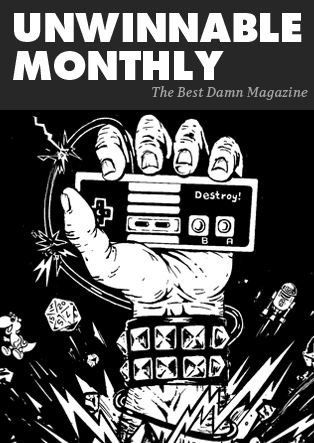 That is some vintage Doom stuff right there. Except maybe the fireball, that’s more Hexen, I guess. Hey, wait a minute, why can I shoot fire out of my hands anyway? Oh, yea, because the residents of Rapture found a strange sea slug on the ocean floor that allows them to rewrite their DNA if they shoot it like heroin. Oh, and there are creepy little girls who collect leftover slug juice from corpses. They’re protected by brutish zombies in old fashioned diving suits. If you get your hands on one of the girls, you can either rescue her by taking some of her slug juice or kill her by taking all of it. Lots of people seem to consider that a profound moral dilemma (though I’m not sure how and either/or decision can be a profound moral dilemma). Perhaps it would have been, had it had any impact on the game other than determining which lame ending you get, but without meaningful consequences, the decision itself lacks meaning. I am not comfortable calling this a masterpiece. Yes, the infamous twist is an amazing feat of story telling fueled by the subversion of videogame mechanics. Yes, Andrew Ryan is a fascinating, omnipresent yet absent antagonist. But Andrew Ryan, the twist and the set up for the twist are very distinctly removed from the actual gameplay, which consists, like nearly every other FPS, of running around cramped environments, shooting everyone you encounter and collecting keys. Bioshock does not innovate nor perfect its basic form. It does not transcend. This is evident from the very fact that, beyond the twist, there are no more tricks left in the bag. The game becomes a tedious slog to a generic end boss that is almost universally ridiculed, even by the game’s most ardent supporters. What does this mean for Bioshock Infinite? The trailer is pretty enough rendition of a flying steampunk city with the art direction that is bright and fresh looking. I can’t speak to the gameplay demo because I’ve not seen it, but I hear it’s still an FPS and you still are mainlining drugs that gives you strange powers. Take that for what you will. Beyond that, we’ll have to wait until 2012 to find out if Ken Levine is the auteur the gaming press so desperately wants him to be. In the meantime, I can finally see this sacred cow for the hamburger it is – tasty but not made to last.